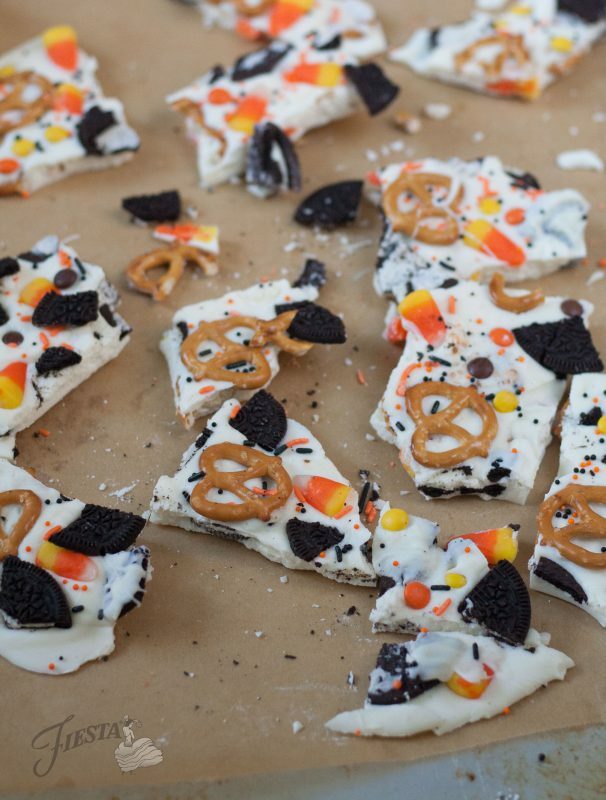 This festive Halloween Candy Bark is the ultimate fall candy treat and it’s a cinch to make. Gift it to loved ones in one of our Heart Bowls in celebration of October’s lesser known holiday: Sweetest Day. Did you know that the third Saturday of October is a little-known holiday called Sweetest Day? It’s origins go back to the 1920s and the concept is much like Valentine’s Day, wherein you give presents like greeting cards and candy to loved ones. 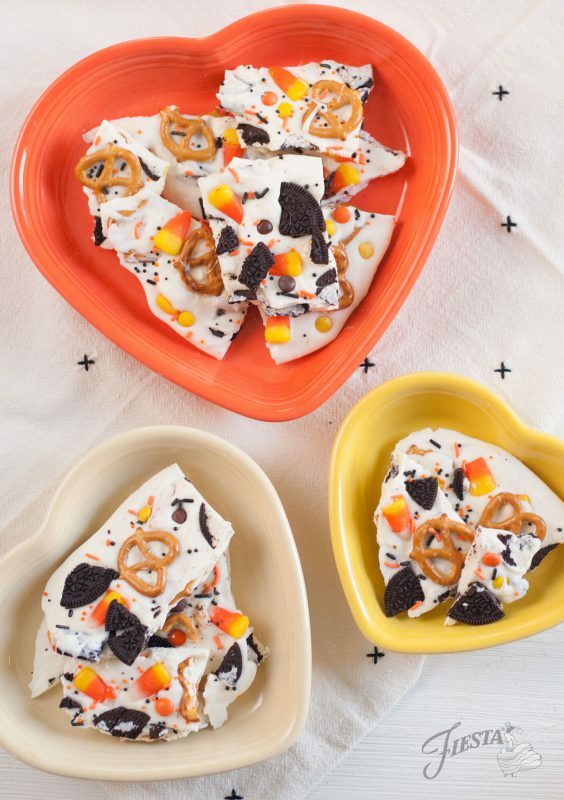 This year, we’re bringing Sweetest Day back into our lives by giving out this seasonally appropriate Halloween Candy Bark in our sweetest dish: the Heart Bowl, because who says you can’t celebrate two holidays at the same time?! 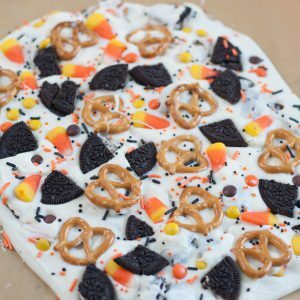 This Halloween Candy Bark is as simple a candy as you could ever make, and the results are not only delicious but beautiful too. 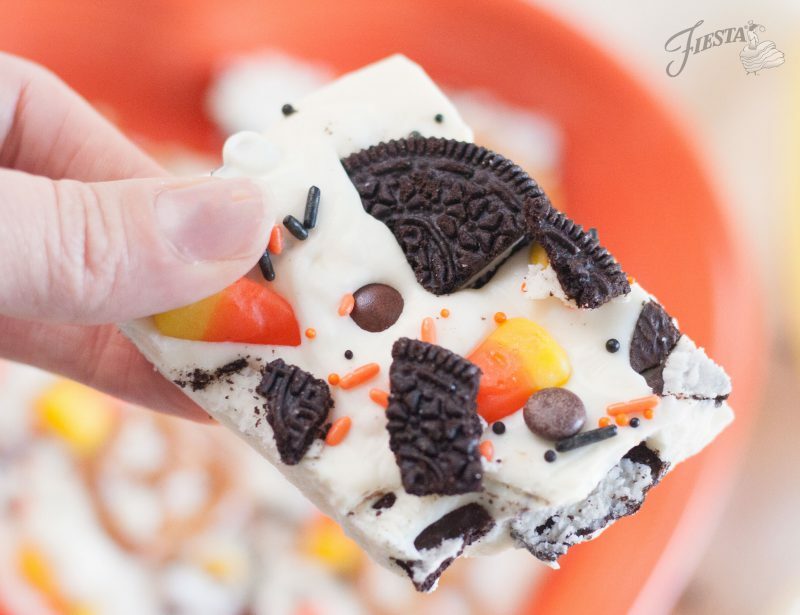 Use whatever toppings that you have around, like those special Halloween chocolate sandwich cookies, various small candies, and even salty snacks like nuts and pretzels. Simply melt white chocolate candy wafers or almond bark and spread in a thin layer on a parchment lined baking sheet. Sprinkle with toppings and then cover with a second layer of melted white chocolate and even more toppings. Don’t forget the sprinkles! Let set until hardened and then break into chunks. Arrange in one of our Fiesta® Heart Bowls and wrap with plastic wrap or cellophane. Your loved ones will be tickled to receive such an unexpected and beautiful gift, we’re sure of it! 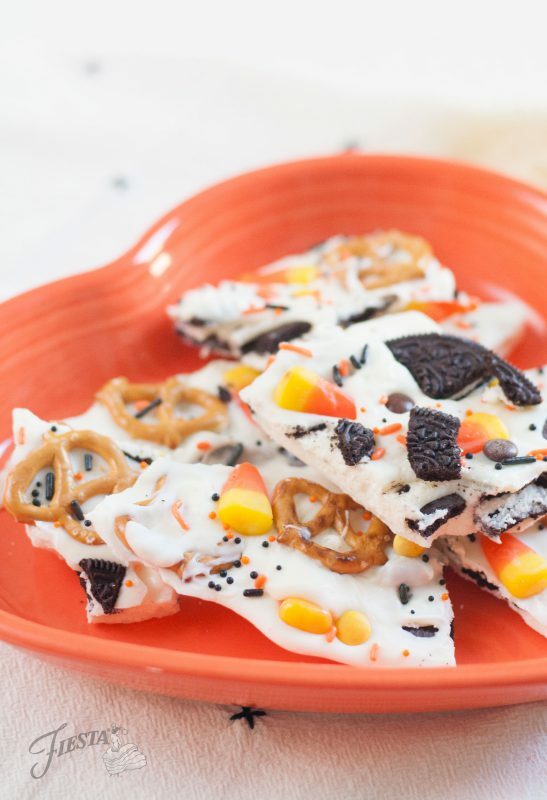 A sweet and festive white chocolate bark studded with pretzels, candy corn, chocolate sandwich cookies and sprinkles. Microwave white chocolate almond bark according to package directions. Stir melted chocolate until smooth. Pour half of the white chocolate (1/2 pound) onto the parchment-lined baking sheet and smooth out with a spatula until it is about 1/4" thick. 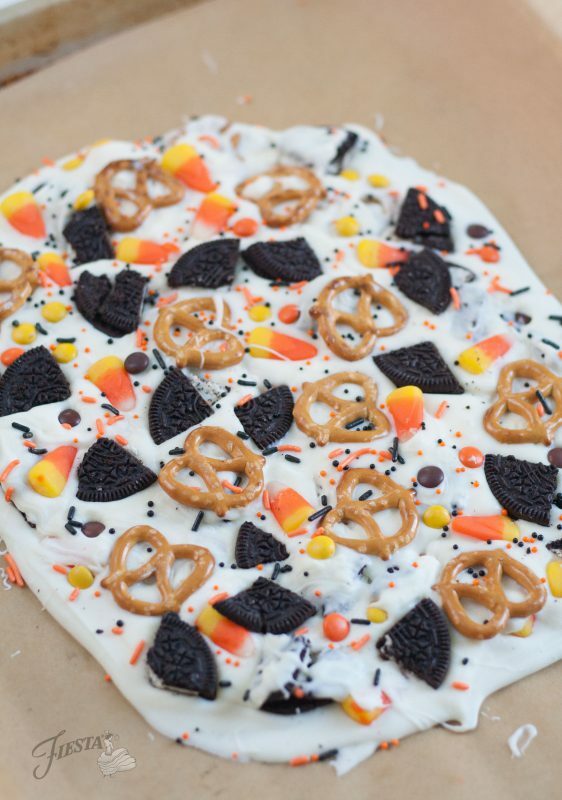 Working quickly, cover the surface with pretzels, cookie pieces, and candies. Evenly drizzle the remaining melted white chocolate over the toppings and carefully smooth out so the whole surface is covered in the melted chocolate. Once again, place pretzels, cookie pieces and candies evenly over the melted white chocolate. Add sprinkles and allow to harden. This can be sped up by placing the tray in the freezer for about 10 minutes. Once solid, carefully break the bark into chunks and serve.